Splendid China was once a bold player in Central Florida’s theme park game. The attraction featured very detailed small-scale versions of Chinese cultural icons. The park was owned by the Chinese government and controversial from the day it opened until the day it closed in 2003. 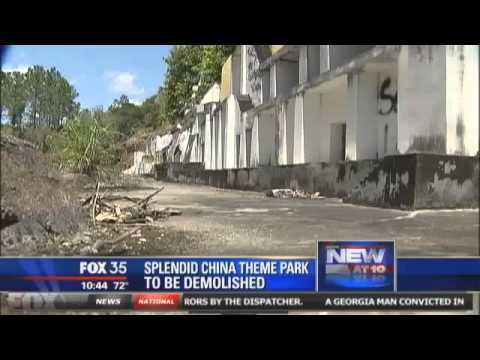 Now, ten years later, the remains of Splendid China, located at Formosa Gardens Blvd. and Funie Steed Rd., are about to disappear forever. Mickey Grossman, of Pro Demo, said all of it will go during a four-week feast of destruction. You can still see some of the amazing scale-replicas walking around the property, though there is also evidence of widespread damage by vandals. “This is called the statue of ah… Buddha!” Grossman explained during a recent tour. About 40 feet tall, the Grand Buddha is perhaps in the best shape these days. Graffiti covers nearly everything, including once hand painted walls. the miniature Great Wall of China, built by hand with nearly 7 million tiny bricks, is overgrown and crumbling. Holes now stand starkly empty of their once magnificent statues. But all the damage dealt to this one-time tourist attraction doesn’t make much difference now, because it’s all about to be ripped down. The demolition, which starts on Thursday, will make way for a condominium development.